Virtual reality is an excellent way to experience movies or games in a new avatar. Some people may be hesitant to try out virtual reality, and if you are one of them, then you are really missing out. The ReTrak Utopia 360-degree VR headset is a great addition to your VR Kit that will let you enjoy the VR world. Although VR headsets were in the higher range earlier, today you can find a whole lot of models in an affordable range. Some VR headsets even cost less than a movie ticket and bucket of popcorn. There is simply no reason why you shouldn’t be checking out a VR headset. This virtual reality headset is perfect to take with you anywhere you go and your smartphone powers the headset. Keep your smartphone fully charged so that you are able to use it whenever you want to and your VR headset stays charged up. Keep in mind that you will need to use your own headphones to get optimum sound when using the headset. If you love gaming and movies, then this headset is right up your alley. You can use the headset to watch your favourite movies and simulation games by downloading hundreds of free apps from the Google Play Store or the App Store, giving you unlimited possibilities. The ReTrak Utopia 360-Degree VR Headset can take you to the other side of the continent, using 360-degrees to watch movies or battle zombies. You just need to download an app to your smartphone, and you can instantly be transported into a different world. The headset comes with a built-in action button for maximum app compatibility and a sliding cover that you can use for augmented reality. The ReTrak Utopia 360-degree headset works with virtually all smartphones, making it easy to use for everyone. With a weight of 1.14 pounds, you don’t have to worry about your neck or head getting tired after prolonged use. The headset is perfect for users who are looking for a great earpiece without a hefty cost. With a full 360-degree experience giving you seamless vision from any angle, this headset is user-friendly and simple to use. Setting up the ReTrak Utopia 360-Degree VR Headset is quite simple as it comes with a quick set-up guide. If for some reason the manual is not with your package or gets lost before you are done setting your headset up, you can also find it online. Though downloading my preferred apps took a bit of time, it allowed me to charge my phone so that I could use the headset for a longer period. Overall, the process was effortless and easy to follow. The headset is designed with three straps that are adjustable to give you a snug fit while wearing it. There is a ventilated cushion to help keep you cool and a cushioned faceplate to make the headset more comfortable at the time of use. With the headset weighing 1.14 pounds, it offers a lightweight feel so you can wear it for an extended period without feeling discomfort or fatigued in your head and neck. The display quality for the headset depends on the quality of the smartphone you own. The headset comes equipped with a dual adjustable focus, with retractable focal length and interpupillary distance. With the Lucidview lens system, you don’t have to worry about glare, and it is equipped with an anti-glare lens that helps reduce eye strain. The apps are available through the Google Play Store or the App Store. The ReTrak Utopia 360-degree VR headset does not come with any built-in headphones which means you need to provide your own for sound. Before placing your smartphone into the VR headset, make sure to plug the headphones in first. When glancing around the internet for reviews on the headset, I found some positive mentions for the ReTrak Utopia 360-Degree VR Headset. Many positive reviews suggest that the price and the overall quality of the headset were great. Many reviewers feel that it is an enjoyable headset to use and fun to use for about an hour. You An eye strain may develop if too much usage happens for extended periods of time. It comes with two versions – one with the headphones and one without. So, if you already have a good set of headphones, you can get just the headset and save up on some dollars. If you take a look at other options, you can find three major alternatives to the ReTrak Utopia 360-Degree VR Headset. 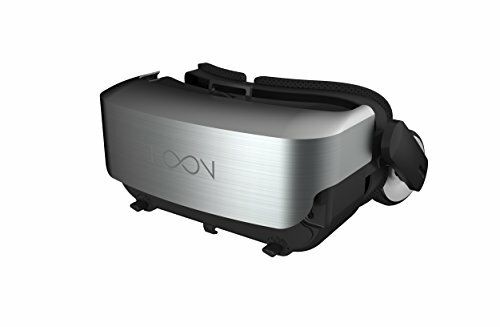 The Noon VR Pro has a 101-degree view which is less then what the Utopia headset offers. Both headsets use a smartphone to plug in, but the Noon VR Pro allows you to connect three devices to the headset on the same home WIFI network, making it shareable with friends and family. The Noon VR Pro headset is slightly lighter than the ReTrak Utopia 360-degree VR Headset. The Noon headset weighs in at about 0.848 pounds, where the Utopia headset comes in at 1.14 pounds. The good thing about the Noon VR Pro is it comes with built-in headphones which offer high-quality 20kHz audio. It is also equipped with anti-blue light to help prevent eye fatigue. The Noon VR Pro offers a lot of great upgrades that the ReTrak Utopia 360-Degree VR headset doesn’t. Between the built-in headphones and anti-blue light, it makes the headset worth buying. The headset is similar to the Utopia since you can watch movies and play games on it, all by downloading apps to your phone. If you are looking to have a good time with friends, then the Noon VR Pro is where you want to go. Being able to connect three devices to the headset makes it great for parties or hanging out with my friends. The only downfall to the headset was the lack of smartphones it was compatible with. The headset was a complete upgrade over Utopia, which resulted in a lesser number of compatible smartphones compared to Utopia headset which is compatible with many phones. 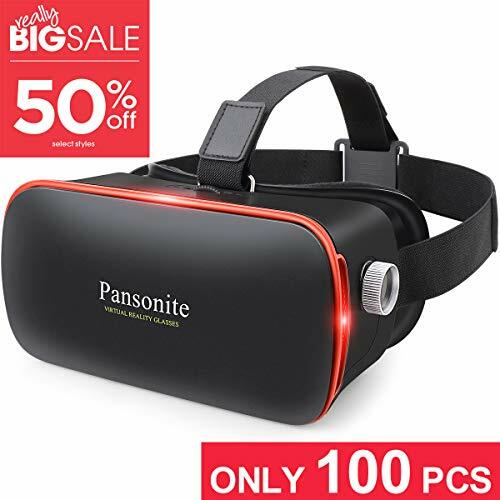 The Pansonite VR headset comes with a breathable leather padding to help keep you comfortable and feeling good after using the headset for an extended time period. The lens is like the ones that are attached on the Utopia headset, they are adjustable and come with a moving button to make the headset wearable for all. The headset weighs 1.39 pounds which is a little more than the Utopia headset. The additional pounds might make it a little harder to wear, and your head or neck could get tired. Like the Utopia headset, the Pansonite VR Headset runs off your smartphone, and its display quality is determined by your smartphone. If you love using a controller while using a headset, then the Pansonite VR Headset is for you. The headset comes with its own lightweight controller that looks like a miniature version of an Xbox 360 controller. Unlike the Utopia headset, the Pansonite comes with built-in headphones that give you stereo sound. 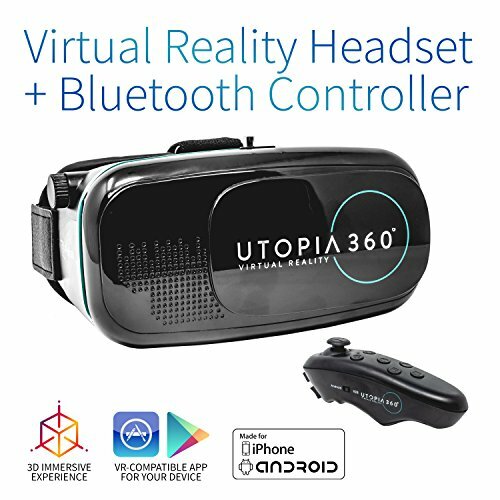 Since this headset offered a lot of upgrades compared to the Utopia headset, I was shocked that it was only compatible with a handful of smartphones. Like the Utopia headset, it works with most iPhones and Samsung phones, but the smartphone users are not as lucky when it comes to usability of the Pansonite VR Headset. 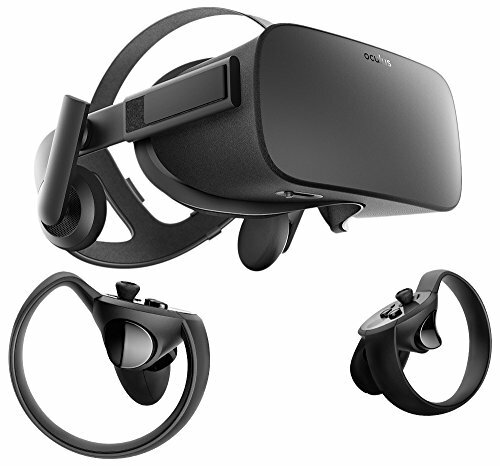 The Oculus Rift is a headset that only works on PC. It is one of the big boys when it comes to the headset and is equipped with a ton of great games and apps that you can use. The headset comes with built-in headphones and two handheld controllers. Like the Utopia headset, the Oculus offers a 360-degree field of view, and it supports full room scales. The ReTrak Utopia 360-Degree VR headset is an excellent headset for both gaming and a cinematic experience. The headset requires no wires, so I was free to roam around my house and not be tied down by things that needed to be plugged in. The headset was affordable, and it didn’t require a lot of equipment for me to use it, all I needed was my smartphone. The number of apps I could download for this headset was the best part of it. I was an avid user of games or videos, and instead, it got me hooked to the plethora of apps that catered to my liking. The headset was lightweight, making it perfect for long periods without having to deal with a fatigued neck or head. Check out the ReTrak Utopia 360-Degree for yourself.